Who would question the need for the state to provide and enforce law? Bruce Benson, that's who. A professor of economics at Florida State University, this is Benson's blockbuster, pioneering treatise, the one that broke up a completely new field study and forced the rethinking of this entire sector. Doubt it? Consider the rise of private firms offering protection and detective services, the explosion in private arbitration, the lucrative business in alarm services, and use of private police in malls and subdivisions. We must also consider the body of private law that has emerged within many associations and business sectors. The market is capable of doing this! But can it do a better job than the state? The waiting time for trial can't be longer. The jails are corrupt and ineffective. The law-making function of the state is egregious and corrupt in every way. From a comparative institutions perspective, state-based law services are shoddy and unworkable whereas market-based institutions are efficient and consumer-friendly. The book came out in 1990, had an explosive impact on libertarian scholars, and then went out of print. The Mises Institute is very pleased to have played the decisive role in bringing this wonderful book back into print and back into public availability. And for only $15 for 400 pages! It's never been more needed. Fasten your seatbelts. You are in for a wild ride. I don't believe how little this book is talked about as it really is one of the best books on privately provided law I have read. 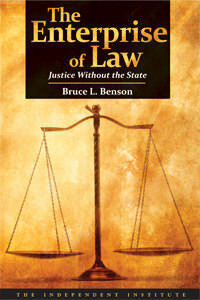 Benson offers a detailed and thorough analysis of government involvement in law and order and private alternatives. It's actually surprisingly apolitical and academic, I would recommend anyone who thinks market anarchists are crazy dreamers who can only rely on ethical arguments or are simply ignorant of the mainstream economic critiques of private law enforcement read this book.